native had two siblings, the late Doris Sonneborn Lippincott ’35 and John Sonneborn ’41. 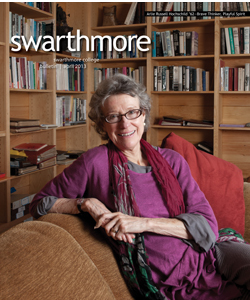 At Swarthmore, Read founded the women’s tennis team. In 1941, she married Dr. Hilton Read, a pacifist who volunteered his medical expertise to the Army as head of Medical Services at the Finney Military Hospital in Thomasville, Ga. Afterward the couple founded the Ventnor Foundation, a nonprofit organization reviving European hospitals after the war. With the Reads’ leadership, 1,600 interns came to the United States from 1951 to 1976 to study medicine before returning to their European communities to rebuild medical infrastructure. Ventnor alumni are still found throughout the world advancing the field. As a lifelong tennis enthusiast, Read supported many tennis programs near her home in Thomasville, Ga. The tennis complex at nearby Thomas University is named in her honor. Read was involved in the Thomasville Entertainment Foundation, Thomas County Historical Society, Thomasville Music & Drama Troupe, Thomasville Center for Arts, Archbold Memorial Hospital Auxiliary, and the First United Methodist Church. In addition to her service on the Board, Read devoted herself to the College through various alumni committees and as an extern program volunteer.